Welcome to Cloud Imperium Games’ Monthly Studio Report for April, bringing you insight into what all of our studios have been working on. This month, the team delivered multiple updates to Alpha 3.1, made advancements on a variety of new systems and features, like scanning and mining, and continued development on Squadron 42. With that said, let’s get to it. The team focused on two major priorities in April: one was the scanning feature, which is making good progress. The focus has been on the code-side that will be used throughout Star Citizen, including for Mining and in Squadron 42. The other priority was Object Container Streaming development, as it relates to making vehicles thread safe. This is one step toward a larger goal being worked on across the company — to provide a significant performance increase in the game. In addition to these tasks, the team provided support in various areas, such as fixing crash bugs on the 3.1 stream, assisting in development on the Anvil Hurricane, and tackling bugs in areas of the game that were hindering development. Tech Design completed their initial set-up of the Anvil F8 Lightning. 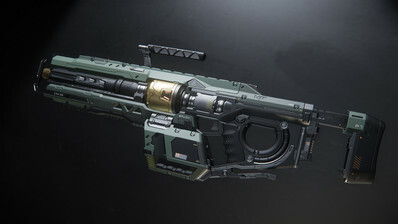 They’ve also been setting up the Anvil Hurricane while the Art Team wraps up their work ahead of the Alpha 3.2 release. Tech Art will begin the damage pass on the Hurricane soon. The teams are looking forward to adding the Hurricane to the list of flyable ships. Tech Design and Art were also busy collaborating on the Consolidated Outland Mustang revision. 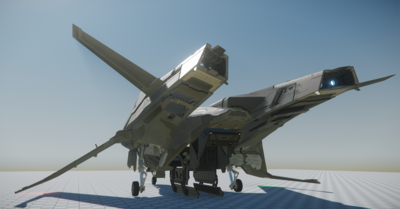 Currently, Tech Art is tackling damage passes for the Aegis Avenger revision and Origin 600i, as well as implementing landing gear compression on various ships. Tech Art also supported various teams and features such as Mining. The MISC Prospector is getting a working boom arm that carries the mining and tractor beam tools. The boom arm will work like a turret and aim where the pilot looks so it can mine asteroids. Tech Art created the boom arm ‘rig’ for the Animation Team, and will help put the asset and animation states into the game. The team developed in-game support for groups that will be accessible on the player’s mobiGlas and Visor. They worked closely with the Spectrum and Backend Services teams to ensure that the feature is as seamless and integrated as possible. The teams met daily to make sure everyone was on the same page, and swift progress lead to the team outlining the Spectrum API to support Groups and Lobbies (which enable Chat functionality). Turbulent will soon implement a stub service according to the spec’d-out API, at which point the team can implement the client side. This will allow both teams to work in parallel, which speeds up development. Once the Spectrum-enabled service is ready, the client team will replace the stub with the real spectrum-enabled service. This will allow the team to test and add more features to the groups system going forward. The Narrative Team delivered a wide variety of content in April. Loremaker’s Guide to the Galaxy toured the Nul system, the new serialized fiction series One Good Deed came to a dramatic end, and another issue of Jump Point was published. The team also delivered content for the Origin 100 brochure and sale page, alongside a host of other marketing materials. Meanwhile, the team worked with art and design to develop a series of templates to not only help flesh out locations and biomes across the Star Citizen universe, but provide a single, consolidated page for anyone in the company to seek out information. Additionally, they worked with design to expand the current list of commodities and resources, kick-off text needs for new 3.2 mission content, and deliver a number of weapon descriptions for new items being added to the game in upcoming releases. For Squadron 42, there were several playthrough reviews at that start of the month that were helpful in highlighting areas that could use an additional environmental storytelling pass. Several documents were then created to assist the Environment Art and Props teams that proposed specific props and set decorations that could help sell the flavor of that particular moment. The team also completed a pass at ensuring all other remaining Squadron 42 narrative tasks have been properly identified and written up so that production can better track the work left to be done. 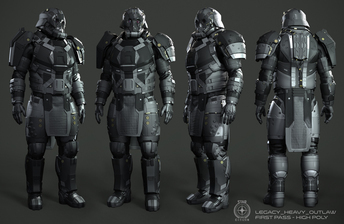 Character Team highlights included revising the Persistent Universe undersuit and all the different legacy armor sets for Marines and Outlaws. The latter progressed well with the release goal being Alpha 3.2.0. The team also completed rounds of R&D on how to implement hair in a more in-depth way than the current system. The team also made solid progress on upcoming Mission Givers and clothing for the Olisar Collection. For Squadron 42, the team worked on many of the principal characters and also moved forward on how they’ll deliver alien archetypes, while collaborating with the Weapons and AI teams to ensure they’re working within established in-game metrics. Finally, the Character Team worked with the Graphics Team to implement the updated glass shader tech that debuted in the Around the Verse’s Squadron 42 update onto the existing helmets. They also modeled various fauna that will bring more life to the ‘verse in the future. Designers put in fixes for the 3.1 release, planned and chipped away at 3.2 goals, and started moving forward with the new pricing model, and incorporating an internal recipe component for each item in the game. This involves extending the commodity and resource list to make it more representative of the final product. Recipes are broken out into three major components: resources, materials and parts. Basic resources can be mined/scavenged around the universe. Those resources can be delivered to refineries and transformed into materials. Finally, manufacturers will combine resources and materials to create parts. The finished purchasable items are comprised of a combination of logical parts and materials. This is responsible for a portion of the item’s price, which will give players the ability to exert influence on the price through avenues such as mining, trading, scavenging resources, etc. The team has also been focused on two major things. First, allowing players to quantum travel as a group with Quantum Linking. They’ve decided to incorporate this into the party system to make it more intuitive for the players. They’re also adding a calibration state, so destinations will need to be calibrated prior to quantum travel (QT) being initiated. Whether or not a group can quantum will be entirely dependent on party members being near each other, and aligning towards the QT Destination being calibrated. Once the target is calibrated, the master calibrator can enable the quantum for all aligned members. The Design Team also added “Orbital Splines.” These will allow the player to select a destination on the surface of the planet, assuming they’re inside that planet’s sphere of influence, and travel to any known location in a single quantum jump. This system generates a spline for the player to travel on. For the first iteration, IFCS will likely align the ship when the player initiates the QT. The ship will travel along the created spline above the atmosphere with the destination in view at the end of the QT, and the trajectory will aim the ship down into the atmosphere once it’s arrived. The team believes this feature will enhance the planetary QT experience. QT will NOT be functional in atmosphere, but once a ship has exited the atmosphere, it can jump to another surface location in a single QT. Finally, Design implemented animations for Levski’s next two mission givers: Recco Battaglia and Wallace Klim. R&D went into creating and implementing a script that will batch import the animation list based on a csv file. This will save a ton of time in the future. The team is focused on getting these whiteboxes signed off and into the game. While they are not on the current roadmap, if ready, they may make an appearance in 3.2. 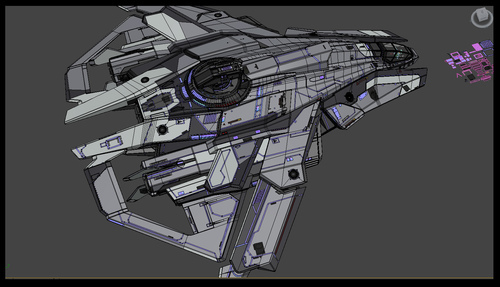 The ATX Ship Art Team concentrated on the high-poly modeling phase of the Constellation Phoenix. They worked to get some interior areas to a ‘final’ stage, which helps them move onto the next area. In a couple of weeks, they will start the ship setup process, model out the damage/LODs, and get the interaction areas working correctly alongside the Tech Design department. They also continued the detail pass on the F8 Lightning by applying the POMs, decals and final geo tweaks. They are currently concentrating on the cockpit, which requires a lot of attention to detail and making sure the interaction points / screens are lined up correctly. After this detail phase, they will work with Tech Design on the ship setup (damage, LODs). Server Engineering worked closely with Turbulent in planning the bridge between Spectrum and Diffusion services. In addition, they’ve created further services under the new architecture. The first is the login service, which coordinates and streamlines the initial login process for the client with the backend. The new login service better manages authentication, notifies required back end components, processes new entitlements (items, rentals), and handles error reporting. They also started planning for new services such as Reputation, Wallet, Badge and Insurance. Finally, the team integrated new tech into the main game code and continued to phase out older technology. The PU Animation Team worked on Mission Givers Battaglia and Brunt, and a gruff female shopkeeper. Animations for the Mission Givers are being polished, while those for the shopkeeper are in the implementation phase. Design also provided support by getting these characters hooked up in game. Additionally, ATX aided other animation teams with mocap cleaning and solving, and kicked off R&D on the bartender and bartending functionality. The Ship Animation Team also took time to improve the current animation pipeline and processes, streamlining the overall process in order to free up animators to work on new feature updates for cockpits. This includes updates to all cockpit types, trigger presses, button presses, and the general cockpit experience. In addition, the team continued work related to the 3.2 release. The planned ships for the release include the Origin 600i, Anvil Hurricane, Aegis Eclipse, and Vanduul Blade. 3.2 also includes art and animation updates to the Aegis Avenger series, and new features that affect ship animations, like the mining arm on the MISC Prospector and manned turrets in vehicles. Finally, the team fixed various bugs and issues that cropped up. The DevOps Publishing Team supported daily publishes for the 3.1.x development cycle. They spent the remaining time analyzing gameplay data and performance analytics, providing daily reports to assist the development effort. The team rolled out additional enhancements to internal performance analytics, allowing them to measure client and server performance indicators at much more detailed levels than before. These analytics can get down to minute levels of detail to help the dev team monitor and tune things like memory consumption by process, processor load by activity, and bandwidth utilization per task. The DevOps BuildOps Team shifted from performance and stability to feature enhancements on the overall build system. This work included new services that enable more finely tuned patches, allowing for more rapid last minute changes. They also rolled out the initial stages of a new internal build process, which breaks out separate build branches to the feature team level. The goal is to reduce internal iteration time for individual feature teams, so they don’t have to wait on the larger internal builds to test their work. Dev teams have provided positive feedback and look forward to the knock-on effect this will have on individual feature development. April was a busy month of balancing priorities for ATX QA. They helped development with fast iterations to the PTU for final fixes of the 3.1.0 cycle. These took the form of patches 3.1.1, 3.1.2, and 3.1.3. Each requiring support from QA to test the build, environment and launcher, monitor results, and provide data to the developers. QA also paid attention to Game-Dev and 3.2 preparations. They bugged up issues that crept in while focus was on the publish cycle, and cleared out the backlogged fixes that needed to be verified. These included mission dialog and reward updates, updates to Field of View transitions, connection recovery, IFCS control systems, and various code changes to entity management. Other projects included an extensive pass over turret functionality and starter ships to help live design identify and prioritize problem areas. The tech team tested updates to the Autodesk tools in advance of them rolling out to developers, as well as new launcher fixes from Turbulent. The Player Relations Team coordinated with several other teams to get 3.1.3 to Live and 3.1.4 to PTU. The 3.1.4 update includes some much anticipated IFCS changes and crash fixes. With 3.1.3 out and 3.1.4 on the way, the team would like to remind and encourage everyone to use the Issue Council to help the team triage and rate bugs and functionality. That data gets used to prioritize future updates, plus Issue Council participation will make players eligible to get into earlier PTU waves. The Graphics Team spent the month on R&D in four different areas. The first is a new multi-layered shader system, which provides a generalized workflow for creating and sharing material layers that can be dynamically combined using the HardSurface and Organic shader currently under development. This system will allow Art Teams to share a similar workflow when it comes to dynamic wear and dirt build-up, unifying the appearance of these important visual features across the game. The second R&D topic was multi-resolution gas clouds, which allows the placement of smaller, more detailed gas clouds inside larger clouds to provide the equivalent of a bespoke location on a planet. This was a particularly complex task because the volumetric nature of gas clouds means that the team had to solve issues with lighting, shadows, sorting, and density seams. This tech is crucial for Squadron 42, but will also be used for building missions in the PU. The rest of the team worked on generalized GPU particle spline support to improve effects such as beam weapons and lightning, improved glass shading for more realistic and dynamic ship canopies and visors, and provided general improvements for all glass and transparent materials. The team spent the start of the month planning for Q2, with Mining and Ship Item Kiosks being two features in need of support. The Mining HUD was designed and iterated on throughout the month with implementation work starting soon. Prototyping progressed in the wireframe stage for Ship Item Kiosks, which helps identify issues with the UX before final artwork is created. Alongside these tasks, the team continued to support the Rest Stops being created by Art. 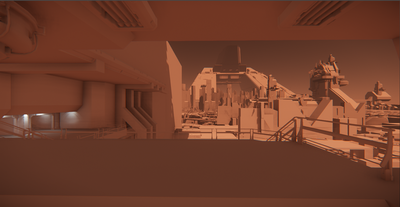 Generic utilitarian environment branding sheets are also being designed to allow the Art Team to have variation in the look and lighting of the environments. Finally, the team made steps to improve the UI Tech. They identified three systems (‘Bindings’, ‘Building Blocks’ and ‘Resource Manager’) that they will scope out and implement over the coming months to make UI creation and prototyping easier for Engineers and Designers. 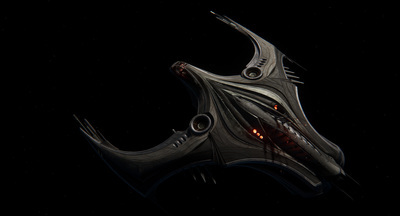 The Animation Team worked on Vanduul block-outs to inform the combat design being developed. They also focused on combat AI actions (grenade throws, diving away from grenades, etc.) and tested different combat styles for varied enemy archetypes (untrained vs trained). The team also spent time on player locomotion (moving stop assets from animation-driven to entity-driven, to give a better parity between local client and server), weapon malfunctions, and tweaks and re-exports to various FPS weapons. They also continued to iron out popping and glitching with the existing usable animation sets. Finally, R&D animation assets were created to test the player knock-down design for combat. The Facial Animation Team collaborated with the Gameplay Story Team on scenes for Squadron 42. PU facial animation polish is ongoing, and plans are in place to further flesh out the existing PU with face animation, like emotes, etc. They also successfully captured more data at a one-day shoot in Nottingham, UK that will go into production soon. 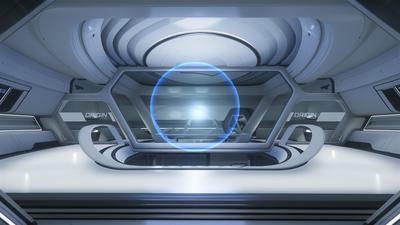 The team focused on preparing “pre-vis” assets for high priority scenes to assist Design with white-boxing. This meant assembling scenes in Maya, building track view scenes in-game, and adding animations to Mannequin. 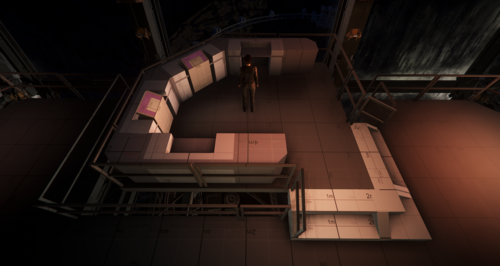 It is useful to see these scenes appear in context within the level flow, and the team is using this as a springboard to improve the appearance and implementation of these scenes. The Actor Gameplay Teams worked on getting a consistent structure in place for picking up and interacting with items, including a new inspect mode for anything the player carries. Now, players picking up an item can select whether to stow or inspect it. While carrying a weapon in the right hand, the player can also pick up and stow smaller items, such as ammo or medpens. This action can be done in various states, be it standing, crouching, sitting or EVA. On the weapon front, they’ve been exploring better solutions for the firing recoil, including bullet spread. The investigation begins with what works and feels right for each weapon between animated recoil, procedural recoil, the effect of recoil on the camera, and how it all ties into the bullet spread. By tweaking these elements, the team will be able to tune each weapon to make it feel satisfying and distinct. Another team has been implementing the new “lean” mechanic, which will primarily be used behind cover. Cover is no longer marked up by Designers as a special “cover” state. Now, it’s much more systemic with the player deciding what to crouch or hide behind, and how to use the environment to their advantage. Being able to lean out and fire is now part of that. They also worked with the Animation Team to improve the look and feel of the start, steps, stops and turns for the player. This was to make the control more responsive, as required from the first-person view, while also looking good in third person or when seen in multiplayer. They also set up a new vehicle team in the UK to support the LA team. They’re tackling the functionality to overclock ship items and all the advantages and risks that entails. For example, overclocking engines might produce more thrust but they’ll overheat and wear faster. This is part of a holistic system dealing with an item’s quality level, wear, damage, and so on. These factors will ultimately decide how well the item functions, if it misfires or stops working completely. Work is underway on the next generation of space stations. This begins with Rest Stops that are created semi-procedurally, allowing the team to easily populate the PU with many variations. To accomplish this feat, they have focused on developing the tools and workflow needed to achieve it. With 3.2 on the horizon, the Ship Art Team pushed hard on the Aegis Eclipse, Aegis Avenger, Origin 600i and Vanduul Blade. Most of the art for these ships is done with the focus now on polish, final lighting and getting the technical things ready, such as landing gear, damage set-up and LODs. The Concept Team completed tasks for the Origin 100 series starter ships, and continued work on four other ships that range in size from small to large. The Audio Department strove to convert all the ship audio to the IFCS 2.0 system, tweaking and modifying values to achieve the previous audio benchmarks. Once fully converted, the team will review the ship content to further improve the audio experience. Another big focus has been designing and implementing the first iteration of audio content for mining. The aim is to achieve a tactile audio experience that both entertains and informs the player. The team also further developed the Foley system, implementing material types to cover all new variants of clothing and armor in the game. Additionally, the team completed a first pass on both the Gemini F55 and Kastak Arms Scalpel weapons. Finally, the Audio Department collaborated with composer Geoff Zanelli to establish the remaining musical themes and motifs to be featured throughout Squadron 42. The team concentrated on the last few pieces of the Rest Stop exteriors; mainly the first-person level areas around the smaller landing pad entrances, which require higher detail passes than the rest of the large-scale exterior. On the interiors, they finalized the approved set of rooms and worked with Design to make sure their needs were met. More work went into procedural prop placement and developing the intended workflow and tools. That means they can further vary the content of the Rest Stop interiors dynamically. On the hangar side, the team is finalizing the greybox set, in particular the large functional wall pieces such as the fuel and repair service modules. They began early material and surfacing breakout exploration. 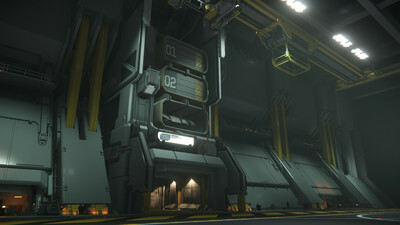 The team is also finalizing the animations for the front and top loading hangar doors, which due to their size have been a challenge to make feel both weighty and ponderous, yet open fast enough so players don’t have to wait too long. The VFX Team, which includes dedicated Graphics and Game Code members as well as Artists, supported several feature sprints, including IFCS 2.0, mining and scanning. These feature requirements are pushing the GPU particle system along nicely. This includes the emit-from-spline required for the mining laser beams, but it can also be used to create more efficient lightning or experimental effects, such as space anomalies. 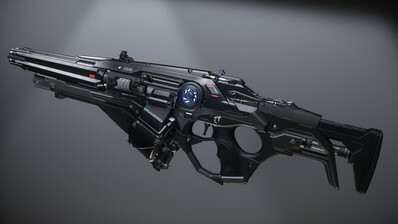 Besides feature support, the team worked on the Anvil Hurricane, the Aegis Avenger rework, and the Kastak Arms Scalpel ballistic sniper rifle. They also investigated general improvements to ballistic weapon effects, such as better muzzles and tracers. VFX Artists incorporated the curl noise improvements made by the Graphics Team last month into Vanduul and Xi’an-specific effects, giving them a unique visual style that will be easily recognizable at a glance. On the VFX tools front, the team created a plugin that allows them to easily export vector fields from FumeFX to engine, and a new set of plugins to allow for easier integration of Houdini into the Artists’ general pipeline. The Weapons Team finished the first art pass for both the Gemini F55 and Klaus & Werner Demeco light machine guns. The team also did research and concept work for personal gadgets and continued various toolset improvements. The Engine Tools Team primarily focused on stability and usability improvements for the game Editor. The main focus was on replacing and improving existing Editor tools that don’t fully cover the team’s needs, or improving iteration times for the Designers, along with preparing future Subsumption integrations and easier Editor plugin creation. The recent work also includes better Data Core integration, improved Object Container workflows, improved Cinematic Tools, improved Editor start-up times, improved Procedural Tools integration, and general Editor stability and code clean-up of legacy code. 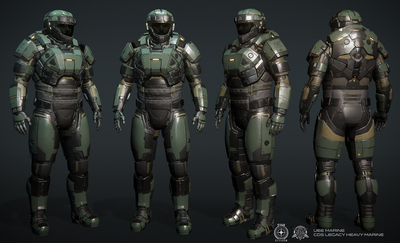 The DE VFX team refined the look of the overall Xi’an tech style. This included rebuilding some of the older existing effects to take advantage of newer technology, such as the Scout death mask explosion and the quantum drive. They’ve also worked on effects for the upcoming resource mining mechanic. The primary focus for the Lighting Team centered on the first pass of lighting for the modular Rest Stop system. 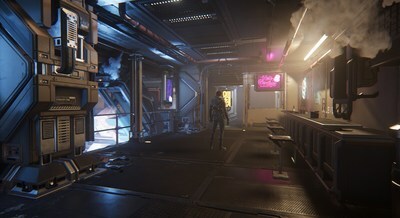 This involved creating a lighting language and full ruleset that could be applied to each modular piece, so that when a new layout is created the lighting can seamlessly blend between rooms, shops and corridors, while at the same time maintaining a consistent visual style across an entire station. 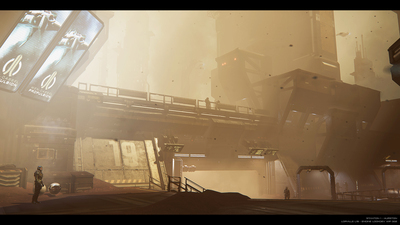 Hurston and Lorville are in full production with the Environment Art Team. They are about to wrap up a first pass on two Hurston ecosystems, the Trash Mesa and the Acidic biomes. These new ecosystems will make full use of all the new features and refinements that the team recently worked on with the Engineers. Expect to see improved material transitions, and better integration of things like rock and terrain assets on the surface, giving everything a more natural and integrated look and feel. Lorville also moved into full production, with the city layout and direction approved by all departments. The art focus shifted towards breathing life into the city, its architecture, and the various areas the players will be able to visit. Prior to the 3.1 release, the QA Team worked with numerous disciplines. Following the release, they focused on supporting the DE Engineering Team. They routinely tested binaries to verify things were functioning as needed before being included into the live branch. They were also tasked with investigating crashes found in the Live release using PageHeap. They often aided the internal development team with various requests throughout the day. From tests to verify if small issues people encountered were due to their local files, or an actual issue within the current build, to the more complex tests that require testing on custom binaries and comparing differences between builds. They also devoted time to Subsumption, performing weekly smoke tests on new versions to ensure its functioning as intended for the Development Team. The DE Tech Art Team continued rigging work on numerous weapons: the Gemini F55 light machine gun, Kastak Arms Scalpel sniper rifle, and Klaus & Werner Demeco light machine gun. They completed R&D on leaning with weapons while Aiming Down Sight (ADS). Early implementation on the leaning was done from a proc clip, which is not scalable to the various weapon types and scopes in the game. The new requirements came from the Tech Design Team, and Tech Art provided a flexible solution where Tech Design can easily modify the results. For the v2 character customization system, they did a lot of R&D revolving around artefact-free adaptation of attachment assets (hair, beards, glasses, armor and clothing) to arbitrary face and body shapes at runtime. The goal is to author any attachment only once for a prototypical face or body, and then automatically and smoothly adapt its shape to any player-customized face or unique NPC created by the Art Department. The same system will be used both internally during asset creation and externally by players during character customization and loadout editing. Since characters, including all attachments and their respective LODs, may consist of more than 100k vertices, special emphasis was placed on finding suitable algorithms that can perform this complex task in real-time. Another focus in the development was making sure that the authoring of assets for use with this system is as simple and artist-friendly as possible, so the Art Department can create them efficiently. They also worked on improving multiple tools for the animation and art pipeline, including Playblast Tool, Custom Normals and a Houdini Exporter. 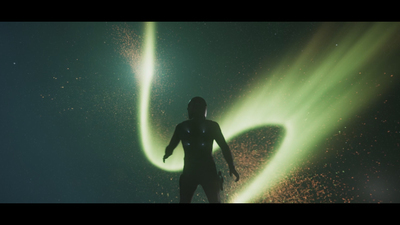 The Cinematics Team finished a sprint to get all high-critical and medium priority narrative scenes represented in the Squadron 42 build. Many scenes were already in-progress, but they wanted to give the level design team a full previsualization export of every important performance capture scene that might be relevant for level flow/pacing and specific environmental art needs. The previsualization effort also added Trackview sequences per scene and scene status commentary. During the process, they also cleaned-up character layers and character loadout naming conventions, which was necessary for easy readability of scene setups and performance within the editor. Once completed, they returned to an earlier chapter to dial in the environmental art for a key SPOILER location. Surfacing and materials needed updating to raise them to current standards, and they’re modifying the color scheme to align it with other ships / locations. Progress was also made on one of the most complex, in terms of logistics and numbers of actors, scenes in the middle of the Squadron 42. The Engine Team directed their attention on various aspects of the engine. The Entity Component Scheduler was refactored to ensure a clearer API (ongoing but nearly finished). The component system has grown over time thanks to work done by different developers that added features. The team first introduced components, then threading, and finally update policies, which reduce the number of components to update. All these updates combined resulted in complex code. The refactor was tackled step by step by making the design more orthogonal, allowing a more flexible way to control components, by for example implementing new activation policies or update frequencies. The team spent time with profiling tools, especially around the 3.1 release. A new system (CIGProfile) was introduced to replace the previous data collecting systems. CIGProfile is designed to be a central system that always collects data (not only when it is enabled), and transfers it to Listener to display. This design keeps a history of performance data. They implemented an auto performance capture that automatically triggers a dump of the performance metrics based on configured settings. With the history, they see when performance started to drop instead of analyzing why performance got worse when profiling after the performance drop. Building on this system, they’re implementing a continuous telemetry system, which always collects performance metrics, allowing the team to immediately see changes and react accordingly. The system is currently in the prototype phase. They also improved the full tracker by making data serialization asynchronous, which helped the issues with server disconnects. Based on similar reasoning, they replaced the std::function object with a custom implementation. The std variant works nicely but can allocate memory, which is not too bad on the speedy memory allocation system. Yet the massive amount of allocations inside std::function affected the memory tracking tools, so reducing them was essential. The implementation now has the same interface and an internal freelist to reuse memory, putting less pressure on the central memory tracking. They also supported the UK team with Object Container Streaming work. BackgroundJobs/Fibers is a central tool to move all the loading code off to different threads. They put the loading code into a fiber, which normally runs on a background thread, and when this fiber encounters code that cannot be executed on a thread, it will queue itself for main thread processing. This works nicely, as it allows parts of the code to run in parallel, without changing the execution logic. With this setup, they ran into an interesting problem. Recursive critical section after a fiber is transitioning from one software thread to another. As this is not a scenario supported by the OS provided constructs, the team had to do their own threading primitives. Those are now fully implemented in user-space (besides using futex/WaitOnAddress as a low-level preemption construct). They also worked on numerous other tasks. This included optimized sub surface scattering (which works with small sample counts), several fixes for large memory leaks of video and system memory (already part of 3.1), and chromatic aberration rendering improvements to preserves sharpness in the center of the screen. The Build Engineering Team started merging the Trybuild codebase with the transformer codebase. This will enable them to have a unique environment for all services, such as the main build system, trybuild, and autocompiles. They also made Dedicated Game Servers available in QA test builds for QA Test Requests (QATR’s). This allows QA members to comprehensively test and control specific things, such as Shopping services, Interdiction, Generated Missions, Friend Lists & Chat, and Persistence. The AI Team implemented the first version of the “Character Skill editor.” This new tool allows Designers to create skill settings for the NPCs, individually configure them, and define how skills and traits influence different stats. Stats are the way skills and traits are converted into numbers that will internally influence the code performing the different actions. Skills and traits can also be used directly in the behaviors to drive the behavior selection, so an NPC can have a different outcome of specific actions based on their abilities, and decide to perform different actions or branch their decision differently in relation to their traits or skills. To improve the combat experience, they introduced the ballistic prediction to use grenades and any ballistic weapon. Now NPCs will be able to understand what type of prediction is required by the weapon they want, enabling the team to create weapon types more efficiently and allow more variations in the behaviors. They also improved the movement system to allow the selection of the transition between locomotion and in-cover state, so that NPCs can correctly align to the cover location in relation to the direction of their target. For dogfight behaviors, they introduced behavior improvements to split fighters and gunships, so players will experience NPCs attempting different attack strategies based on the ship and its physical abilities. Pilots flying fighters will attempt to decouple their movements with their attacks, while gunship pilots will prefer to circle their targets to take advantage of their turrets. 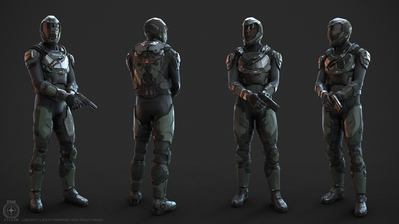 Work started on the Vanduul characters, preparing all the basics on their behaviors so design can iterate on them. The System Design Team was busy with AI related features. FPS AI now know how to flank the player to surprise them and throw grenades in numerous ways and situations. Design work is also wrapping up on how the NPCs react to grenades thrown at them; whether they get surprised, leap out of the way, etc. For Ship AI, they’re splitting the combat behaviors into pilot subclasses, so that the AI know how to fly ships that have specific tactics. For example, a Starfarer should not dogfight like a Gladius, so a Starfarer pilot needs to be aware of the turret placement and not necessarily use their main guns to attack. They also assisted the AI Team with the initial pass on Vanduul Combat AI. They continued populating modular hangar common elements with NPCs to make places feel more alive. This will be an ongoing process until each location feels adequately populated. They also made progress on mining and most of the basic elements are near completion. Once the elements are finished, they will combine numerous elements and reassure everything works as intended. They also planned additional content for Area18 to bring it up to a full landing zone status. This means designing the space for a proper spaceport, shops and services, as well as adjusting it to accommodate all the new content. 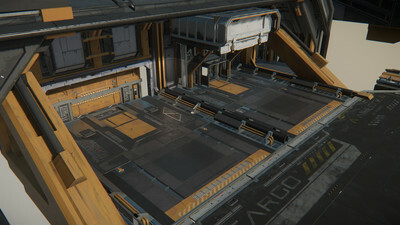 They also continued work on the procedural tool, looked into procedural prop placement, and built a library of whitebox rooms and connectors that the tool will use to generate stations. April saw big leaps in Spectrum development and releases, as well as security upgrades, promotional pages and a new support center. 3.7.4 was released live on production. This release included block list, custom roles and custom emojis. The team appreciates all the “Spectrocatis” providing bug reports to help get the release ready for the live publish, and all the backers personalizing their organizations by adding custom emojis. The UX Teams completed a series of user interviews to improve plans for the voice/friend channels in Spectrum. Thanks to all those who participated. 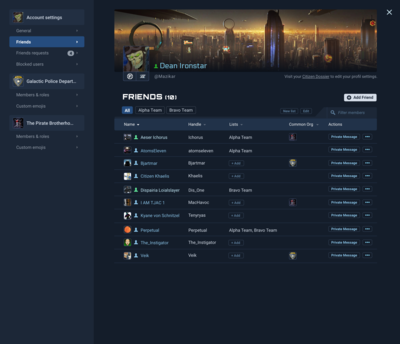 The UX and Design team completed work on the friends list, although some iterations and changes are expected as designs are implemented. Here’s a sneak peek at that work. Currently, the Spectrum Team is on a sprint to get the friends system feature complete. After that, the team will test it extensively on PTU and rely heavily on the “Spectrocati” near the end of May. The team made improvements to the RSI site. New security measures were added to prevent brute force attacks and reduce hacked accounts. Force 2FA was added for melting and gifting pledges to further protect accounts. 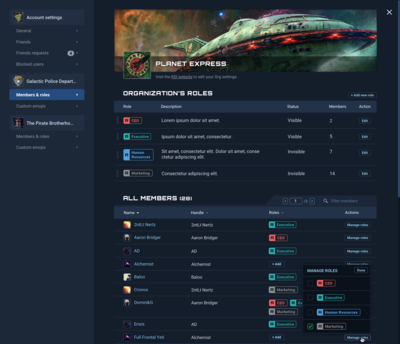 Changes were made to the Roadmap backend Jira import script to expand across multiple teams, allowing CIG production teams more autonomy and flexibility when building their release schedules. The Turbulent Team supported the presentation of the Origin 100i, including a uniquely designed concept ship page. 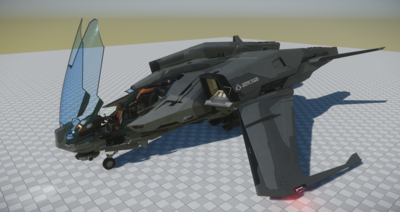 The team setup and provided support for the 3.1 Free Fly where new users and existing backers had an opportunity to fly the Cutlass Black and roam planetside in the Tumbril Cyclone. Lead devs spent a week in Austin making technical design decisions for the implementation of group system. 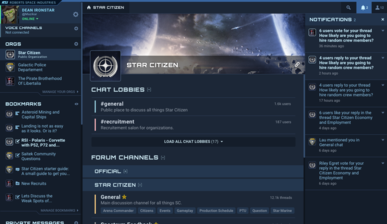 The Group system is a necessary feature that will completely change the way you play Star Citizen with friends. Knowledge base development is complete. The team added it to the mobile designs, making sure all aspects of it are accessible on all devices. They also worked on implementing a contact form that is user friendly and streamlines responses from a CIG Player relations agent. Knowledge base is on track to launch in the month of May. Last month’s report ended on a high note by welcoming the 2 millionth citizen to the ‘verse. In case you missed it, the team also celebrated this milestone with a Letter from the Chairman. Special Spectrum badges and sporty in-game t-shirts will show the dedication of everyone who was a part of the project before hitting the phenomenal 2 million mark. The Free Fly event held this month gave prospective citizens the chance to get into the ‘verse and take some ships and vehicles for a spin. With that, the journey towards the 3 million citizens has begun. 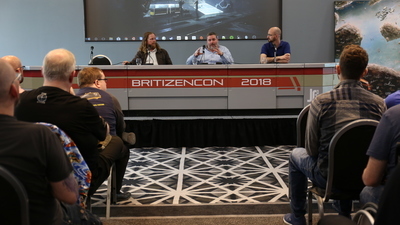 On April 21st, team members took part in BritizenCon, the UK’s biggest community-driven Star Citizen event. Congratulations to all the organizers for putting on a successful event. BritizenCon included several developer panels, raffles, and a thrilling dogfighting tournament. BritizenCon also marked the launch of the new website of JR Fabrication. 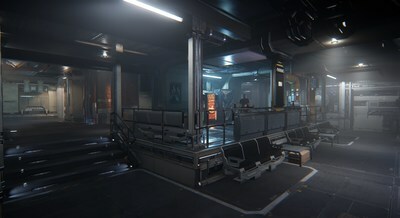 The company creates real-life outpost furniture, as seen on the show floor of Gamescom last year, and the cargo crate that played an integral role in the 3.0 trailer presentation at CitizenCon 2947. 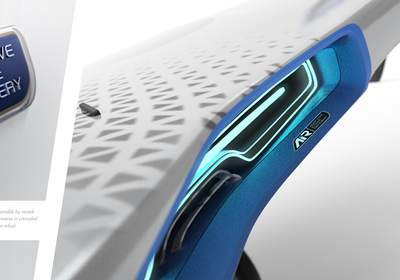 In April, the team revealed the innovative 100 Series from Origin Jumpworks. With a cutting-edge fuel intake and the unmistakable Origin design, it is a valid alternative starter ship to the Mustang and Aurora. The introduction of the Origin 100 series was accompanied by a Shipyard post that dove into how fuel mechanics currently work and what’s in the store for the future. On the event front, the team is currently running a promotion in cooperation with Intel. Selected streamers are showcasing the power and improved performance that is unlocked with an Intel Optane SSD. Make sure to check out Mitauchi and CrucianGaming streaming throughout the week and head over to Spectrum for a chance to win one of those incredible SSDs yourself. Participate in the ongoing screenshot competition and take your gaming setup to the next level! To learn about what’s coming, head to the Roadmap that now includes the plans for Alpha 3.5! The Roadmap expanded its reach into the first quarter of 2019, and the team will continue to iterate on the 3.5 branch as they progress through the year. Finally, the team released details for CitizenCon 2948 to be held in Austin, TX, on the 10th of October. Visit the event page to find out when tickets go on sale and how to prepare for what is shaping up to be the biggest Star Citizen live event yet. And with that, see you in the ’verse!